L.A Women: Njideka Akunyili Crosby. By Michael Slenske. When Nigerian-born artist Njideka Akunyili Crosby opens the door to her East L.A. studio, it’s not the optical overload of her densely collaged figurative paintings pulsing from the walls that first catches my attention. Nor is it the box of gigantic grapefruit picked fresh from her Highland Park yard on one of the work tables. Or the hundreds of vintage reference images of family, friends or socialites in the pages of Ovation magazine (Nigeria’s analogue to US Weekly) that are scattered about the floors of this former furniture shop. No, it’s two words printed down the left side of a faded blue T-shirt she’s wearing: “Slow Down.” Wishful thinking for the 33-year-old rising star, whose increasingly coveted works on paper can’t leave the studio fast enough. Often built from family or staged photos shot with her husband, they’re rendered in acrylic shaded with pencils, which are then layered with hundreds of acetone photo transfers (of, say, Nigerian star Genevieve Nnaji, fashion ads from Lagos-based designer Maki Oh, or street photos the artist snapped on trips home), as well as a diminishing supply of ceremonial aso-ebi fabrics, from her brother’s wedding or her mother’s senate campaign. Within the process, Akunyili Crosby’s materialist mash-ups juxtapose everything from African dictators to American pop, the influence of blaxploitation movies on Nigerian street style to British colonialism and the works of Vilhelm Hammershøi to Josef Albers via seductive patchworks whose unique visual language winks at the art historical while simultaneously writing a new chapter. 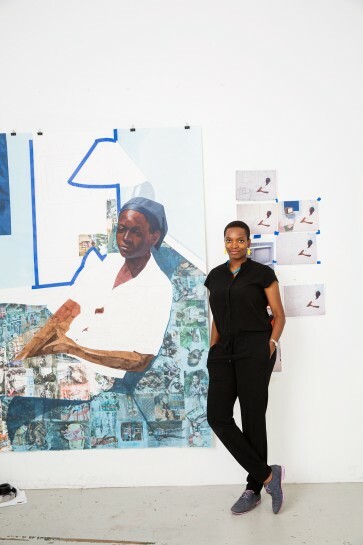 In the past year alone, Akunyili Crosby—whose first name is pronounced “nnn-jee-deh-car”—has participated in several group shows (including the Whitney’s current portraiture survey, “Human Interest”) and five solo efforts (at L.A.’s Hammer Museum, Mark Bradford’s Art + Practice, the Norton Museum of Art, the Whitney’s billboard project and London’s Victoria Miro Gallery, where she’ll make her solo European debut in October), while earning a spot on Foreign Policy’s 2015 list of the Leading Global Thinkers.